A multidisciplinary collective made up of the artists Phunam Thuc Ha, Tuan Andrew Nguyen, and Matt Lucero, The Propeller Group uses sophisticated digital tools to explore cultural and political phenomena. The group often crosses over into the commercial spheres of video production and even advertising, engaging the viral potential of mass media and pop culture to address sociopolitical issues in impactful ways. Recent projects have explored the musical and ritualistic affinities between Vietnamese funereal traditions and New Orleans second line processions, the celebrity status surrounding memorial images of Russian dictator Vladimir Lenin, and a commercial advertising campaign for the contemporary Communist Party. 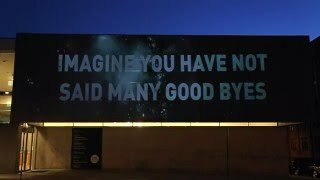 For Street Views , The Propeller Group presents their first public artwork, a video drawn from A Universe of Collisions, their multi-part project produced by Grand Arts in Kansas City in 2015. Inspired by an artifact found on a Civil War battlefield of two bullets that had collided in mid-air, the group sought to re-create this unlikely fusion of enemy weaponry. Transposing it to the contemporary analogy of the Vietnam War and the battle between communism and capitalism, the video depicts the moment of impact when bullets from a Russian AK-47 and American M16 crash into each other. The action is captured on high-speed cameras and slowed down to a meditative pace, dwelling on the aftermath of the collision. Appearing almost as an abstract cosmos, the lingering debris acts as a poetic metaphor for the larger history of war and political ideology. A poem by the Kansas City-based artist José Faus is superimposed over the imagery, lending texture to the story at hand. While a technological marvel, the project nonetheless raises timely questions about the cycle of violence that is continually enacted not only between nations on a geopolitical stage, but also closer to home in our neighborhoods and schools. The Propeller Group (established in 2006) comprises artists Phunam Thuc Ha (b. 1974, Ho Chi Minh City, Vietnam), Tuan Andrew Nguyen (b. 1976, Ho Chi Minh City, Vietnam), and Matt Lucero (b. 1976, Upland, California), who live and work between Ho Chi Minh City and Los Angeles. Recent solo exhibitions include such institutions as the Carnegie Museum of Art, Pittsburgh, and Grand Arts, Kansas City, Missouri (both 2015). The group’s work has been featured in numerous group exhibitions, including at the 56th Venice Biennale, Venice, Italy (2015); Prospect.3 New Orleans (2014); Guggenheim Museum, New York (2013), Made in L.A. 2012, Hammer Museum, Los Angeles (2012), and the New Museum of Contemporary Art, New York (2012). Their work is in the permanent collections of such institutions as the Museum of Modern Art, New York; the Singapore Art Museum, Singapore; Queensland Gallery of Modern Art, Brisbane, Australia; and the Los Angeles County Museum of Art. The Propeller Group: Fusion (After a Universe of Collisions) is organized for the Contemporary Art Museum St. Louis by Kelly Shindler, Associate Curator. Special thanks to James Cohan Gallery, New York.